Drexel University wrestling faced off against Navy and American in closely contested matches, but Drexel could not pull off wins (Photograph courtesy of Drexel Athletics). 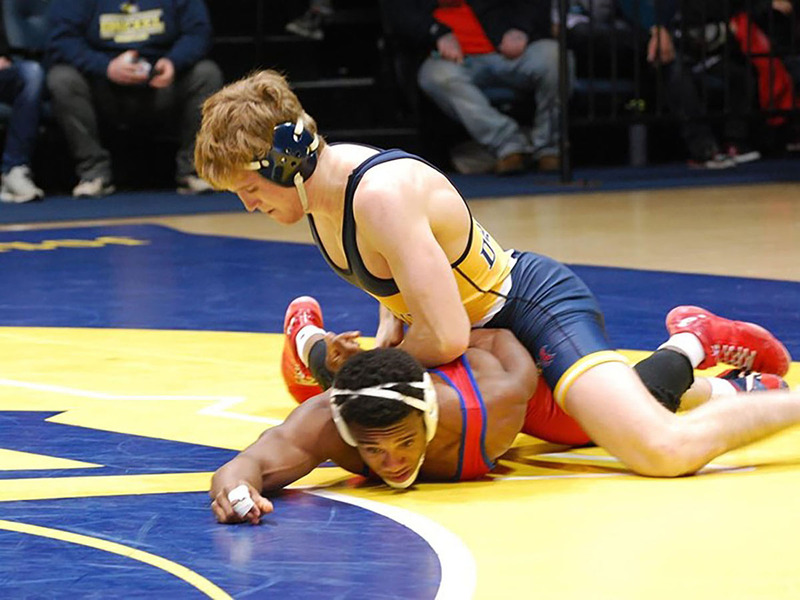 Following a number of away dual meets and tournaments, the Drexel University men’s wrestling team returned to league competition Feb. 1 when they faced the Midshipmen of the United States Naval Academy. This was the third time this season that Drexel would be going up against an Eastern Intercollegiate Wrestling Association rival. The Dragons held a modest 1-1 league record before their contest in Annapolis, Maryland, and ended up dropping the matchup against Navy despite some solid individual performances. Drexel came to the mats with somewhat of an advantage over Navy, as three of the Midshipmen’s starters were unable to compete on the day. The depletion of their roster seemed to have no effect on Navy though, as they opened the day with five straight match victories. The first match, at 125 pounds, seemed to foreshadow how the day would play out as freshman Antonio Mininno was outmaneuvered by Navy freshman Jacob Allen through raw physicality. Mininno was unable to match the pace set by Allen who took a 9-5 decision. One of Drexel’s most dynamic and exciting wrestlers to watch this season has been red shirt sophomore Parker Kropman. Kropman was again able to put on a show for the crowd at 149 pounds, as he capitalized on the slow start of Navy junior Jared Prince. Though he managed an early lead, Kropman was unfortunately pinned late into the second period, as Prince decided to wake up and initiate his usual quick offense. The 157-pound division had two sophomores duke it out for a chance to clinch some points for their squads. Sophomore Evan Barczak was put on the pats against Navy’s Quentin Hovis. Hovis asserted himself very quickly by figuring out Barczak’s patterns of movement and picking his rival apart. Barczak never managed to catch up to Hovis, who eased up on his opponent after securing a sizable point gap in the first period. In the wake of Hovis’ 11-4 decision win, Drexel now trailed 19-0. Drexel was finally able to secure some points after junior Ebed Jarrell, one of Drexel’s nationally-ranked grapplers, found and exploited the weaknesses of Navy sophomore Tanner Skidgel in the 165-pound match en route to a 9-4 decision victory. Jarrell had to fight for every point he got during the later portions of the match, as he trailed 4-2 in the final period. Jarrell turned the tide at the last moment with a takedown and a near pin, earning his 50th collegiate win in the process. Though Jarrell’s win put the momentum on the side of the Dragons, it was all too brief, as Navy would take a win at 174 pounds to go up 22-3 and take the whole meet with three matches to go. The deciding bout saw redshirt freshman Bryan McLaughlin versus Navy senior Jonathan Carrera, the latter of which would go on to seize the winning 7-4 decision. With the match decided, Drexel’s final two performers, redshirt seniors Stephen Loiseau and Joey Goodhart were relieved of pressure, allowing them to perform without nerves. This was evident in both of the matches of the upperclassmen. Loiseau dismantled Navy junior Alex Benoit via a 16-0 technical fall in the first period, while Goodhart didn’t allow any significant offense from Navy senior Thomas Ott, finishing up the last match of the meet with a 10-1 majority decision win. The Drexel squad wasn’t given much of a recuperation period, as the Dragons were back in action a day after their loss to Navy, hosting the American University Eagles at the Daskalakis Athletic Center Feb. 2. Drexel pushed through their lack of rest throughout the duration of their second EIWA league meet that week, but were ultimately unable to overcome their fatigue. Drexel got off to a slow start as they dropped their first two matches at 149 and 157 pounds, with Kropman and Barczak suffering close decision losses to their opponents, respectively. Once again, it was Jarrell who was the first to get Drexel up on the board with his emphatic fall victory over American redshirt sophomore Elijah Murphy, tying the overall score up at 6-6. A sense of urgency was renewed for Drexel as freshman Anthony Walters’s defeat at 184 pounds cut down Drexel’s lead to a single point. Thankfully for the Dragons, Loiseau and Goodhart stepped up in their back-to-back bouts to significantly extend Drexel’s lead. Loiseau would control American redshirt sophomore Prince Hyeamang for over half of the 197-pound match time. Goodheart, who led in scoring after the first period of the heavyweight match against redshirt freshman Niko Camacho, went down two points near the end of the third period, but finished strong by freeing himself from the bottom position and mixing in a takedown with riding time to take a 5-2 decision and push his team to a 16-9 overall advantage. While the efforts of the Drexel heavyweights were admirable, their work was undone in the final three matches of the night at the lightest weight classes. Mininno was on the receiving end of a 4-3 decision loss at 125 pounds, which, combined with sophomore Chandler Olson’s loss to American redshirt senior Josh Terao, gave American their second lead of the night at 18-16, leaving the final result dependent on the outcome of the last match of the night. The 141-pound match which dictated the final score pitted junior Nick Widmann against American redshirt senior Jack Mutchnik. Mutchnik put up some late offense to secure a 3-2 decision, giving American the 21-16 win, while handing Drexel their fourth consecutive league loss. Drexel’s wrestling squad is now 1-3 in the EIWA conference and 0-2 in their most recent league dual meets. The Dragons will return Feb. 10 to face league rival Binghamton University in hopes of securing a necessary win to determine their standing going into the EIWA Championships.